The 200 Duke was the stepping stone into the KTM world till recently, but a price tag of Rs 1.50 lakh ex-showroom is steep for the quintessential Indian father when it comes to buying his son's first motorcycle. Not to forget, the apprehension given its 25PS output. Even then, the idea of the 125 Duke would have been laughable for India until not long ago. 125cc bikes have traditionally been simple-looking, fuel efficient motorcycles rather aggressive ones offering high-strung performance. But not anymore, with KTM launching the 125 Duke here. But priced at Rs 1.18 lakh ex-showroom, is it a good idea in a price sensitive market like ours? Shumi's first impressions about the 125 Duke at Bajaj Auto's test track were interesting, but he only rode it on track. Time to tell you how it feels in the real world! The KTM is a unique motorcycle - you can't really categorise it as a '125', given its 14.5PS output, fat upside-down front forks, fat tyres and six-speed gearbox. 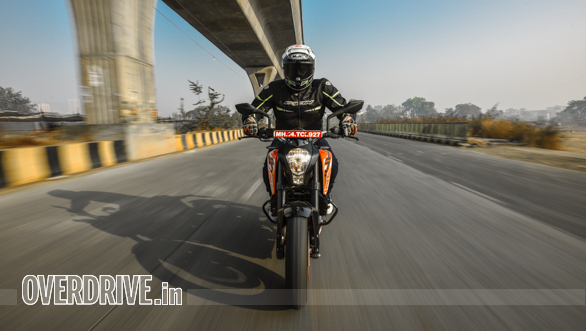 Of course, the distinctive KTM Duke styling means heaps of attitude! I won't harp too much about the design  we know the 125 Duke launched in India is wrapped in the older design and looks identical to the 200 Duke. 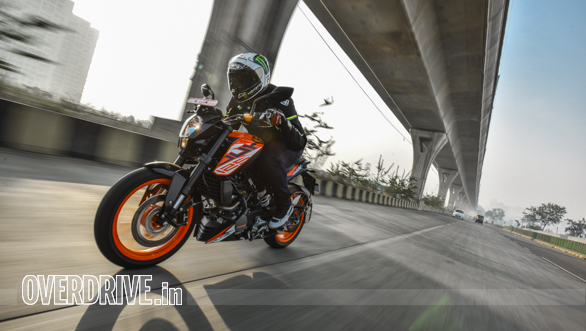 But before you cry foul, let's admit  if KTM were to bring the updated 125 Duke to India, it would have been too expensive to make sense and I'm talking more than just the design. And the older design still looks neat, though obviously it is no match to the new 390 Duke or even the 250. I'm also sure a lot of riders who have moved on to bigger machines (from the 200 and 390 Dukes) will have a bit of a spark in their eyes on seeing the 125 Duke and perhaps even reminiscence their time with the Duke given how much fun the Dukes are. What's more, the 125 Duke is a premium, performance oriented machine that has 150cc bikes in its crosshairs rather than 125s given its 14.5PS output, so the aggressive styling works well. It has the street-cred buyers would look for, especially with the upside down forks (first for a 125 in India), the aggressive streetfighter stance and fat tyres. And its 124.7cc, liquid-cooled motor  liquid-cooling being a first for a 125 in India  also impresses in the acoustics department. 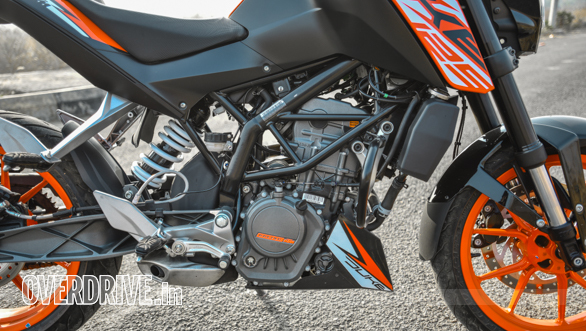 Fire it up and you are treated to the familiar KTM exhaust note, one that is almost like a brand identity. Rev it at standstill and you are realise the 125 isn't as quick revving as the bigger Dukes, but the exhaust note means business. Performance though pint-sized, is engaging too. As long as you bear in mind that it is just a 125, the Duke feels impressive. With a speedometer-indicated top whack of just over 110kmph it is faster than most 125s, but isn't one to set 0-100kmph times. 0-60kmph is impressive at 5.5 seconds and that's at least a second quicker than most 125s and just under half a second slower than the TVS Apache RTR 160 4V (5.09 seconds). More importantly, the 125 Duke has the same franticness we've loved the Dukes for and the 125 wants to be ridden hard, just like its siblings. It also has the little 'kick' the 200 Duke offers at about 7,000rpm. It's a lot milder, but reminds you that the bike you're riding is a KTM Duke. limited. The radiator fan came on umpteen times in traffic but engine is heat is never an issue given the engine's diminutive size. And fuel efficiency is impressive! The sixth gear  again, a first for a 125 in India  helps bring highway efficiency close to the 50kmpl mark, 48.6kmpl to be precise. City efficiency in our test was 44.3kmpl, translating to an overall efficiency of 45.4kmpl. Then there's the ride and handling. The tried and tested trellis frame, 43mm upside down WP forks and WP monoshock feel as good as ever, making for a good handling package in conjunction with the 110-section front and 150-section rear MRF Revz tyres. Tyre grip is a little too much for a 125 though and as Shumi pointed out, the setup, straight off the 200 Duke, is a little overkill here. But that doesn't take away the fact that the 125 Duke is easily the best handling 125 and will challenge sporty 150s in this department without breaking a sweat. The bike also impressed us on the braking front, though I wish it was equipped with dual-channel ABS and not just a single-channel unit. On the whole, the 125 Duke is sweet and likeable, and is certainly a package for youngsters to hone their skills on though. 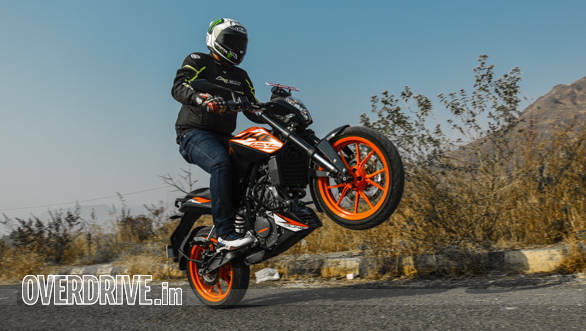 A puny, 125cc engine does not mean the KTM 125 Duke will not let you have fun on one wheel! The 125 Duke is a pint-sized dynamite. It has enough firepower to enthuse inexperienced riders and also dance to the tune of more experienced ones, though the latter will be left wanting for more. It thus makes itself convincing enough for apprehensive fathers to sign that cheque, though at Rs 1.18 lakh it is expensive. It sits above every other 125 in the country and a lot of 150s as well, including the well-acclaimed TVS Apache RTR 160 4V. In fact it costs exactly as much as the Yamaha FZ25, which is a likeable, well-built 20PS commuter. But going by initial responses, the 125 Duke is clicking with audiences and if price is no bar, it is a bike that will keep father and son both happy. The former will appreciate that performance isn't over the top, while the latter is sure to enjoy the crisp responses and show off a bit too.